Summary: the task is to develop effective method for ignition of BATES grain ends in multigrain motor. One of the problems of solid rocket motors is slow build-up of pressure at the initial stage of combustion. The reason for this is delayed ignition of some portions of propellant surface, in particular in the deep pockets between BATES segment ends, where region of stagnant flow exists. It is common practice to place igniter not near the nozzle, but as deep in motor as possible, because it took a long time for flame front to reach upper grain if motor is ignited from the nozzle. So why we expect quick ignition of the deep intersegment pockets, if we ignite them "from the nozzle"? These pockets can be about 30-80mm deep in big motors, this is the size of small rocket motor core. So I believe we need some ignition composition in these pockets. Several such compositions are in use now: Richard Nakka's KNO3-C slurry, painted on the grain ends; Jimmy Yawn's fuse paper. I use secondary ignition composition (SIC) in all my motors. All these methods work, but it would be interesting to compare them (and some others) in equal conditions. 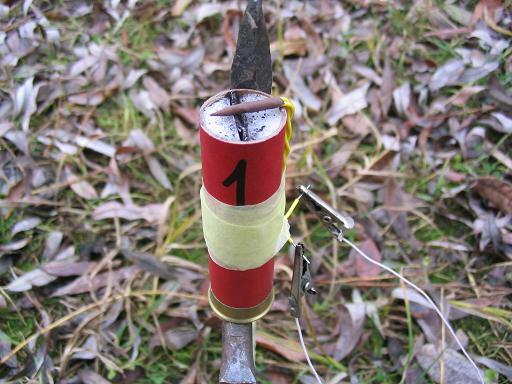 The task of this first experiment is to develop a method for quantitative comparison of different ignition compositions. 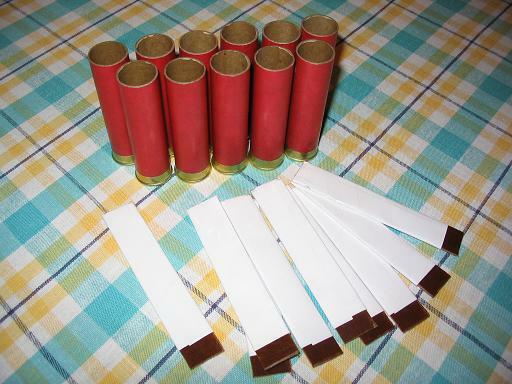 I use paper shotgun shells 18 mm ID, filled with KNSB with flat core (2 mm wide), closed at one end. 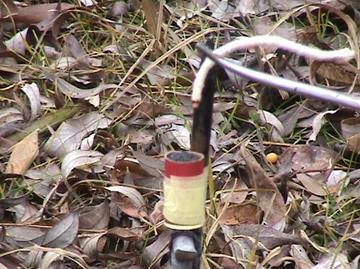 Igniter was attached at the other end. 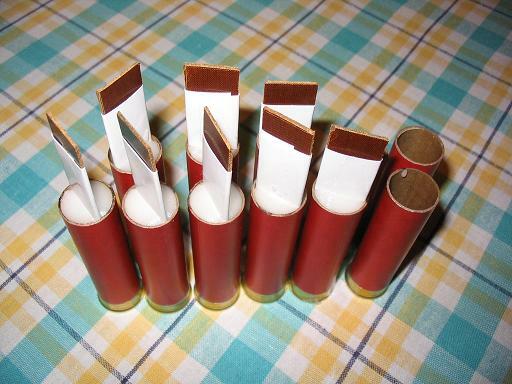 Core was filled with different ignition compositions. TW is burn time of 8 mm layer of KNSB. 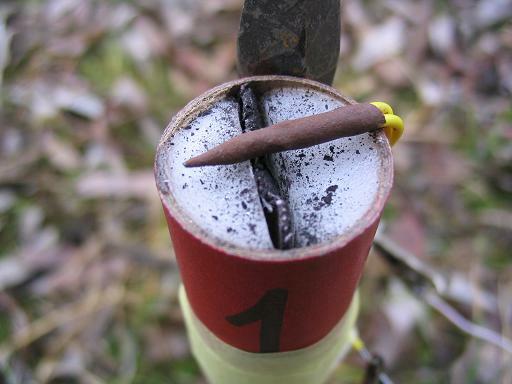 Two samples were tested with core, opened at both ends, as Richard suggested. 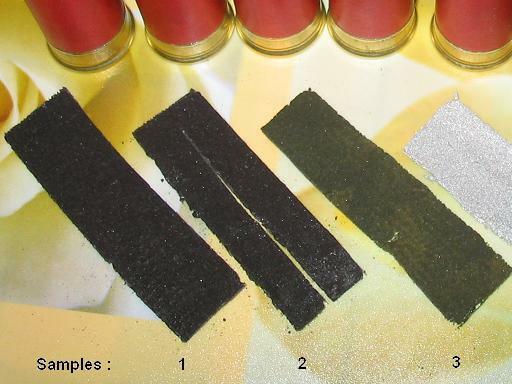 Three endburning samples were tested too. Core formers were covered with 2-3 layers of paper, then with Scotch tape. 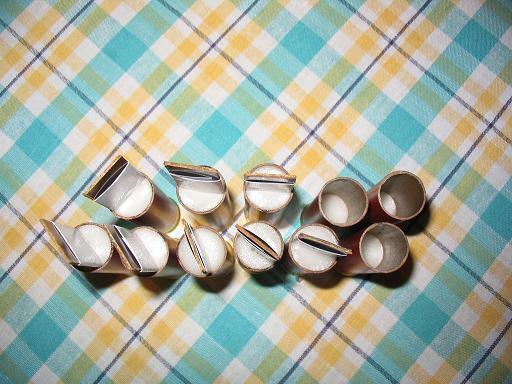 KNO3-sorbitol propellant was poured in the shells, then core formers were inserted. After curing core formers were pulled out, then paper with Scotch tape. 1-6: core closed at one end. 1. SIC-1: KNO3-C-sucrose-iron oxide 75-15-5-5. Red, yellow or brown iron oxide may be used with equal success. 2. SIC-1. A long cut was made along the centerline, this greatly facilitates flame propagation. 3. SIC-2. KNO3-C-starch-iron oxide 74-20-1-5. 4. SIC-3. KNO3-Al-S-iron oxide-wallpaper glue(modified starch) 57-30-10-1-2. 5. core filled with commercial BP (grain size 0.5-0.8 mm). 7,8: core opened at both ends. Ambient temperature was +5C. Measured burn rate at this condition of this propellant batch was 2.5 mm/s. 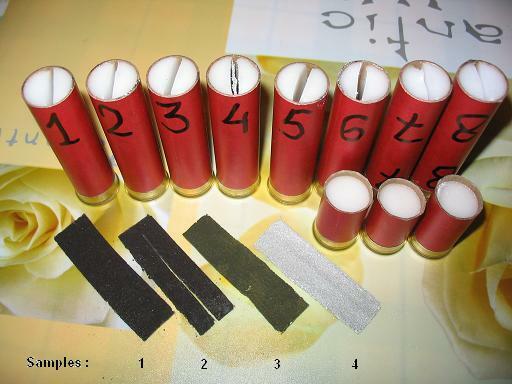 Samples were fixed vertically with electric igniter on the top. Burn video: 1, 2, 3, 4, 5, 6, 7, 8 (500-800 KB). 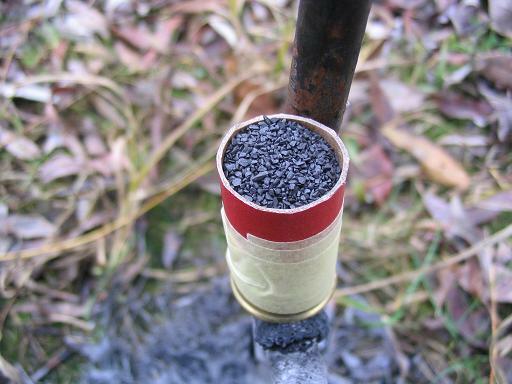 Endburning samples were covered with BP (2 mm thick layer) or a piece of SIC-1 or SIC-3. They were igniter with smouldering wick. 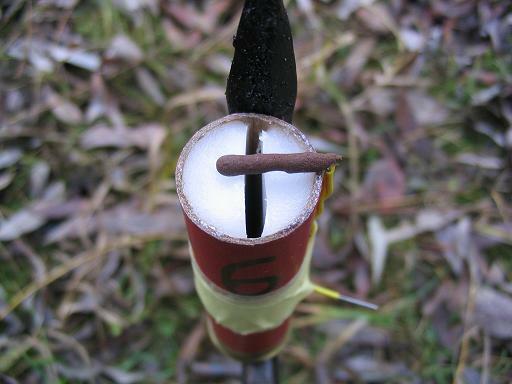 It was found that it is impossible to ignite SIC-3 by this wick, so a small piece of match head was placed on the SIC-3. Burn video: 1, 2, 3 (300 KB). Core ignition time was calculated as (total burn time) - 3.2, where 3.2 is calculated burn time of 8 mm layer of KNSB. Conclusion: closed core setup can be successfully used for quantitative comparison of different ignition methods/compositions.